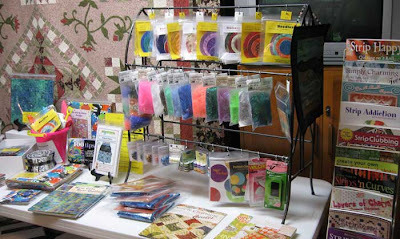 Fiber Antics by Veronica: A day with the Tennessee Valley Quilters Assoc. 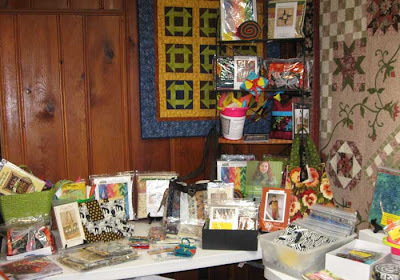 A day with the Tennessee Valley Quilters Assoc. 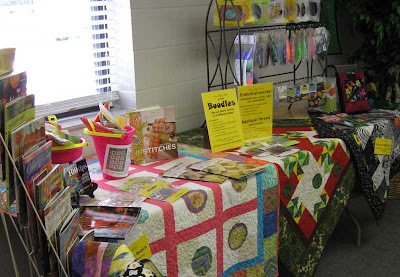 Stone Light Studio vended at the Tennessee Valley Quilters Association (TVQA) annual Assembly Day event this past weekend. Assembly Day is a day when all member quilt guilds of the Association (which encompasses the Tennessee River Valley area—Tennessee, Georgia, Alabama and Kentucky) assemble for a day of quilting activities—a quilt exhibit, a presentation by a national quilting instructor or industry personality, shopping, Show and Tell, a quilted wearables floor show, door prizes and various association announcements. It was a bustling day with lots of excitement, renewal of friendships, food and fellowship. Members from the three hosting guilds were friendly, helpful, attentive and very organized. Things ran very smoothly which makes it a pleasure for us who vend at these kinds of events. Here are some of our offerings which we packed for the show. During a lull in the activities, we had the opportunity to visit with the other vendors. In a conversation with Wanda from the Lebanon Sewing Center, she was amazed and impressed to discover that I had quilted all our quilts using freehand (no mark), free-motion quilting and a domestic [Janome 6500] sewing machine. "I was sure they were done on a long-arm, computerized Gammill machine," she said. It's always nice to hear when people take notice of your work. It's especially gratifying and humbling to receive compliments from one's peers. Store display at the 2009 TVQA Assembly Day.